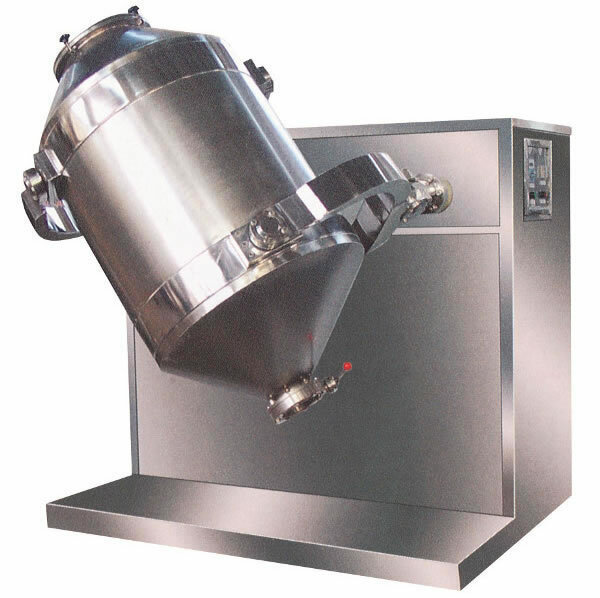 The 3-dimensional motion mixer is a high efficiency mixer, widely used in the pharmaceutical, foodstuff, and chemical industries, for mixing powder/granule materials. It does not use centrifugal action, thus avoids any layering or agglomeration during mixing. It is able to reach a uniform mixing effect, with a mixing rate above 99%. With a high load factor of 80%, while that of normal mixer's is 40%, the 3-dimensional motion mixer is an ideal model for mixing, with a short mixing time. It offers a compact structure, and the stepless speed regulating transmission (adjusts speed by inverter or electromagnet), makes its operation very convenient. Each part of the chamber has an ARC transition and is polished precisely, and thus meets the GMP requirements. The 3-dimensional motion mixer mixing barrel is suspend, fixed on the ends of driving and driven axles through two Y type gimbals, which is crossing and vertical to each other space. When the driving axle is forced to rotate, the gimbals make the barrel perform the translational, turning and rolling movement in space. This causes the materials to perform 3-dimensional motion inside the barrel. Thus, the three-dimensional motion mixer mixing barrel causes different kinds of materials inside the barrel to flow, spread, and intermingle with each other and finally form a new, uniform material. 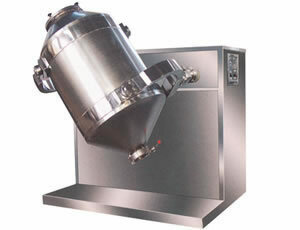 We are a 3-dimensional motion mixer manufacturer based in China. We provide a vast range of products, including V model mixer, belt drying equipment, circle vibrate sieve, fine grinding machine, and others.